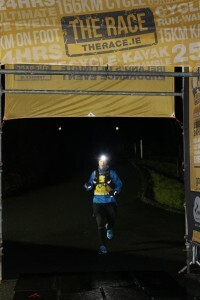 The Race, is a multi-disc ipline endurance event, run over a 250k course in Donegal. It is made up of six stages, being a 23k run, 15k kayak, 96k cycle, 5k mountain run, 68k cycle and a 42k run, over some of the most challenging terrain in the country. It’s an event for which the objective is to finish within the 24hour window, and for most, the race is against the course, rather than other participants. My preparation for the event started a full year prior, when I went to Donegal to see the 2015 Race, and at that point, I really felt that there was no way I could complete the course, based on what I saw. I signed up for it when registration opened in April, and from that point, everything I did in training and racing was building to the 5th March 2016. To put it in perspective, in the 12 months prior to the start, I clocked about 1,900 kilometres of running and over 4,000 kilometres of cycling. Training really started in earnest in October, and I was lucky that Paul Tierney, a previous race finisher as many will know, agreed to coach me (read, listen to me complaining!). He put a programme together for me, which eventually ran from then, right up to the week before the race, and he gave lots of useful advice. This kept me on track, and forced me out on days that it was very tempting to stay indoors! We worked out my target times for each of the stages, which would get me in under the 24 hours, and at the time, Paul said that if time was to be lost, it would be in either something going wrong that was not planned, or time wasted in transition – and he ended up being right on both counts. If anyone is thinking about entering, there are probably a few things to consider. The training is character building, to say the least. It’s long days in often terrible conditions, lots of trial and error in gear, kit, clothing & equipment, hours of preparation for some sessions, and frequent explanations to friends and family about why you are missing events. It’s expensive. It consumes your time and energy in the constant planning and reworking of those plans. But. It’s life changing. It’s such a major event, with so many stages, and miles to cover over such a long time, that it’s hard for most people to even imagine how it can be done. For a triathlete, it probably compares to an Ironman – the ultimate test of fitness, mental and physical endurance. Many will think that it’s about finishing, but as far as the race organisers are concerned, and I agree, getting to the start line, and putting yourself on the line is the biggest achievement. At that point, the hard work is done, and it comes down to determination and a lot of luck on the day. It always hits me, that for every race, no matter how much effort goes into preparation, and how much you try to keep it out of your mind that you are going to have to do it soon, someone with a megaphone says the word ‘ten’. The butterflies are amped up to full, you wish your fellow participants the very best of luck, you think to yourself, damn, I should have gone to the loo one last time, and then you hit the road. Go. have just one more day, and I decided that from that point on, that I was going to be double positive and really enjoy the experience. I was really glad of the moment later in the race, as the fatigue took hold, and I started to get really down in myself – I just reminded myself to be positive. By the time I got to Ramelton, the day was bright and dry. I was a bit behind schedule at this stage, but it was nothing I was concerned about, and I rolled into and out of transition quickly, heading towards the kayak stage, where I hoped to be able to pick up some time. I bumped into Joe and Brendan in the early stages of the kayak and we had a quick chat. One of the lads asked about Dean, and I said that I hadn’t seen him, but I knew his pace was similar to mine, so he could not have been far behind. The water and weather were nice and calm for a while, and we thought that things were going great. That didn’t last long. The weather turned nasty, and it got very bumpy (a technical term!) which made gaining ground very difficult. In the briefing the night before, we had been warned about this section. The guy basically said that he wouldn’t go out in it, but they were OK to send us out! We were surprised that it actually went ahead. Parts of the water were very shallow also, which made paddling difficult. We ended up paddling into quite high waves, and progress was really slow. The tide then turned, and every stroke was harder – we could see the pier on the horizon, but it seemed to be moving further away rather than getting closer, and I was getting increasingly concerned that I was actually not going to make it. I had hoped to keep the whole race slow and steady, but I found I had to double down and push hard just to get to the shore, and fortunately got there in the end, but I was wrecked. Anyway, into transition to get out of the gear and on to the bike – we were all frozen, but at least the weather on shore was good. Brendan was heading out when I got in, Joe was in shortly after me, and we swapped a few war stories from the past few hours. Then Dean came in with his box, and had to tell us that he missed the kayak cut off as the tide had turned and the course became impossible to complete – we were devastated. Amazingly, the first thing he did, was to start offering his gear to us, and then he helped us to get going on the bike. It was one of the worst things, to have to say goodbye, and head out on the first bike. I had read a previous report on this stage, and the person described it as the most difficult 6 hours of his life. In my mind before the race, this was going to make or break it. If I could get it completed in as close to one piece as possible, I had a chance of getting to the finish. On the day itself, having spent so much time in the kayak, I was way behind schedule, and in danger of missing the cut off time. I had planned on taking 6 hours, but I needed to make up time, and pick up the pace. I didn’t have time to eat in transition, so I ate on the move, before I hit the hills. Fortunately, the weather was good, and other than for a few places, the wind was not too strong. The climbs, though frequent, were not particularly difficult, and I just pushed through it. At one point, I passed a marshal, and he shouted after me asking did I know if there was anyone else behind me. Not good. Not good at all. The race was really on now. Every now and then though, I would steal a glance at the scenery, which was nothing short of stunning, and remind myself of what a privilege it was to be able to cycle in such a beautiful place. I was glad to make up some time on this stage, and I rolled in to the Muckish transition with about 30 minutes to spare on the cut off. it broke up the day a little. I spent most of the descent looking out for Joe, as I was afraid that he had not made it to Muckish before the cut off, and it was a huge relief when I got down that he had. Like myself, he was tired, but determined. I had met Brenden on my way up, as he was heading down, and he was just heading out on the bike when I got to the bottom, looking very strong. We would always have said, that once you get back on the bike at Muckish, the back is broken on the race. You are more than half way at that point, and the chances of voluntarily pulling out after that point are almost nil. In the container, I grabbed a quick bite of some pasta, changed, fell twice, the first time breaking someone’s plastic box, and the second time knocking a cup of tea all over one of the other lads, Trevor, then I refilled the bottles, and got back on the road, after a quick word with Barbara and Eimear. I covered a lot in one sentence there – but looking at how long I actually spent in transition, time wasted really, it says a lot. The first part of this cycle is downhill, so it’s a great chance to get the legs moving, pick up some speed, and knock off some kilometres. The hills start again after 17k, and even though they aren’t as severe as in the first cycle, the build-up of fatigue starts to take hold, and I have to say I found this cycle harder than the first one. Of course, at this stage, it’s also getting dark, so the body, which has been going for over 14 hours at that point is starting to think about perhaps stopping for the night. Once it gets dark, it’s also hard to keep a sense of direction, or have a sense of elevation – you can’t see very far in front, so you don’t know if the hill is short or long (they were mostly long!) unless you could see a light out in front. With this cycle, my planned time was 4 hours, but I needed to continue to claw back time, so I re-doubled my efforts, with the objective of being back in Glenveigh, through transition, and out on the final stage by 10pm. It was a little after nine when I got off the bike for the last time. When I got into transition, who did I meet only James and Dean. 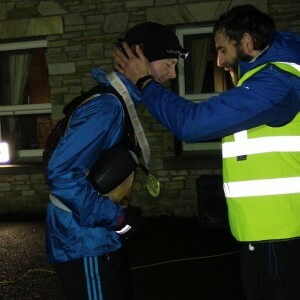 Dean, who had started the race at 5am, was at the final transition to help us get through as quickly as possible, and more importantly, give us moral support before we headed back out into the night. I got some food into me, had some soup, filled my bottles, changed clothes, and headed back out the door, all in the space of 5 minutes. I lie, it took 40 minutes, but it felt like 5 at that time. The two lads could not have done more for me, and they were able to help Joe too – he rolled in just behind me, and I was relieved he had made it. My objective was to get started as quickly as possible, as I knew I would need a lot more time than others to finish the marathon, so I headed out at about 9:45pm. I knew Joe would pass me on the final run, and this is exactly what happened. The same as everyone, in the run up to the race, I tried to visualise the day, and imagine what I would feel like at various points. I heard it described recently, as ‘thinking about your thinking’. It’s important to do, because if you know how you expect to feel at a certain point in the race, then when it happens, you are ready for it. In the pre-race thinking, I imagined that the most difficult thing that I would ever do voluntarily in my whole life, was walk out the door of the transition to start the marathon. It ended up not being too bad, and I was very positive as I headed out the door. I had a little over seven hours to get it done, and collect my medal back in Gartan. Let the countdown begin. and made some small conversation – he was checking to make sure that I was OK to proceed into the park, and I passed the test. At that point, my feet were in a bad way, as I had worn the wrong socks, but I said nothing in case he tried to pull me from the race. The marshal told me I had 25k to go, and I was deflated, as I thought it was way less. Anyway, into the park, and a downhill section, so I decided to take advantage, and run for a bit. That didn’t last long with my feet, but I did a kind of run / shuffle that would have been embarrassing, if it wasn’t after midnight in the middle of a national park, and there was no one for miles. I lost all sense of direction in the park, and after another several hours, I arrived out to meet some more marshals, who told me that I still had 19k to go. WHAT? On I shuffled, and maybe 2k later I passed one of the race signs, telling me I had just 20k to go. I almost lay down and gave up, but I trudged on, up yet another hill that went on for miles. At this point, I started singing to myself, out loud – my motivational songs to keep me awake and moving forward. By the way. No. I’ll never tell anyone what they were! I recalled my moment earlier in the day, kept telling myself to stay positive, and keep moving. I was becoming increasingly aware that time was ticking down towards 5am, and the kilometres were not disappearing fast enough. Again, after more hours, I arrived out to another checkpoint, and they told me I had still 10k to go. It was about 3am at this point, so I thought as long as they are accurate, I would make it. Stay positive. I kept going, up over yet another series of hills, and after loads of twists and turns I lost my sense of direction, and I thought I was lost for some reason. I nearly burst into tears at one stage, thinking that I had come this far, but I was going to fail at the final fence. I took a right turn, and after heading down a road for several minutes, I had second thoughts and went back – I realised that I had followed a sign that was nothing to do with the race. I don’t know why I went back, but if I hadn’t, I would still be wandering around Donegal. By this stage it was a quarter past four, and time was running out. Throughout the day, I had asked a lot of my body. It had carried me around 245k of the toughest terrain in the country, but I had yet more to ask of it. I had to start running. Paul Tierney arrived in a car, rolled down the window and said that the entrance to the centre was 1.3k down the road. I took off. He called after me to tell me that it was Paul (he didn’t initially recognise me in the dark, and thought I didn’t recognise him). I shouted back, “I know, but I have to go!” Daniel got out of the car, and ran with me for a few minutes, then they got back in the car, and headed to the centre to cheer me in. The buzz was building, and the marshals were sweeping up the last of the competitors still out on the course. I passed the last marshal at the entrance, gave her a high five of thanks for staying out all night for us, and headed for the line. As I approached, I could hear the lads (some finished hours, and some not long in) and I motored over the line at what felt like a hundred miles an hour. I was very emotional, and I got my medal in the end. It was so strange – I went from being very confident early in the race, to nearly losing it all in the last hour, but I had finished in a total time of 23 hours, 31 minutes and 25 seconds. It was a great privilege to be able to take part in such a great event, so close to home. It was the ultimate test, and I’m just glad to have finished. I couldn’t have done it without a lot of support, both at home, and from the GoTri group of fellow athletes. To everyone that followed my blue dot on the tracker, and particularly those that provided on course support on the day – words can’t express how thankful I am. I’m delighted for everyone that made it over the line, and for those that didn’t, there will be another day. Indeed, many more days. We have a great team of people interested in this type of event, and it’s a great pleasure to train and race with them. Will I do it again? Absolutely. ← Do you learn anything the second time you’re kicked by a horse?